A landlord, landlady and two other members of their family had to be taken to hospital after a fire at their Cornwall pub. 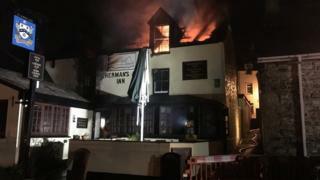 The blaze, at the Fisherman's Arms, in Fore Street, Newyln, started in a first-floor room between midnight and 01:00 GMT and destroyed the building. At its height, firefighters from seven fire engines were tackling the blaze. A two-year-old springer spaniel was believed to have died in the blaze, a friend of the family said. Cornwall Fire and Rescue Service said it was alerted to the blaze at about 00:50 and crews from Penzance, St Just, St Ives, Tolvaddon, Hayle, Truro and Helston were sent. The pub's family were taken to hospital to be treated for the effects of smoke inhalation, incident commander Ian Neal, of Cornwall Fire and Rescue Service, said. The fire started in a first-floor bedroom before spreading to the ground floor. Mr Neal said the first floor was ablaze when crews arrived but they were able to stop it "from spreading much further". A fire investigation team was to determine the cause, he added. A neighbouring house lost roof tiles and suffered water damage. Devon and Cornwall Police said that a number of nearby properties "were evacuated as a precaution" and roads remain closed in the area. Family friend Julie Haynes told the BBC that the family was "devastated at what has happened". An appeal for aid and clothes for the family had been started by people in the area, she added.